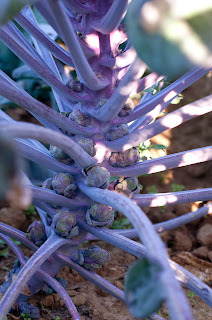 Robson's Farm: Brussels Sprouts...On the Stalk! Brussels Sprouts are one of my biggest pet peeves. Growing up, my dad grew a lot of Brussels sprouts which we piled high in our store. They were fresh, gorgeous, and still on the stalk. Every fall about 20 times a day I would get asked, "Do you have any Brussels Sprouts?" They would ask this question as they were standing right next to them. 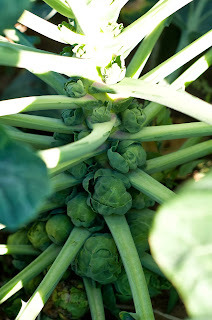 When I would point to the Brussels sprouts there was a moment of shock and aw. Mind blown. 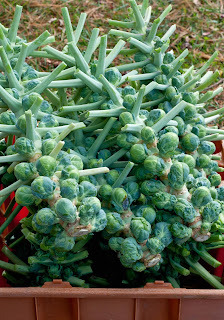 Brussels Sprouts actually look like that?!? Indeed. It is a sin that in most stores little Brussels are ripped from their stalk and sold loose. Where's the fun in that! I am a huge proponent of selling items like they appear in the field....Brussels Sprouts on the stalk, Fennel with all of it's frilly "hair" Carrots with tops, Beets with a little dirt etc. 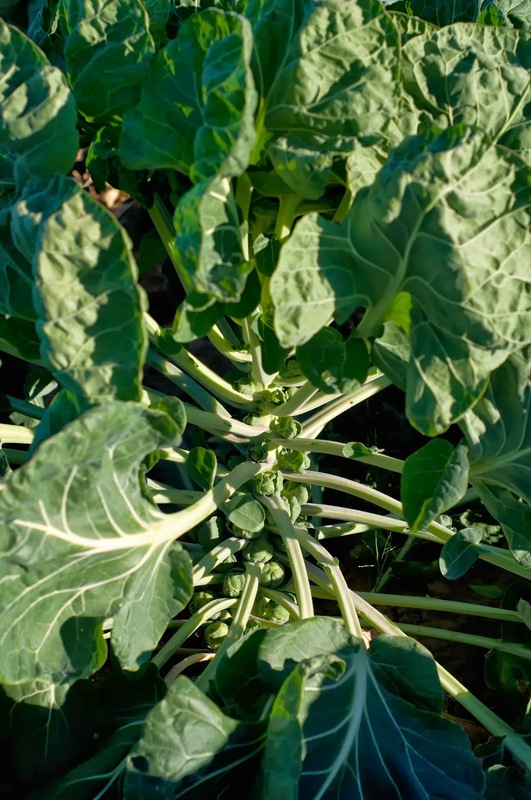 Brussels Sprouts take over 100 days to reach maturity. Such a long time...this is almost double most items. 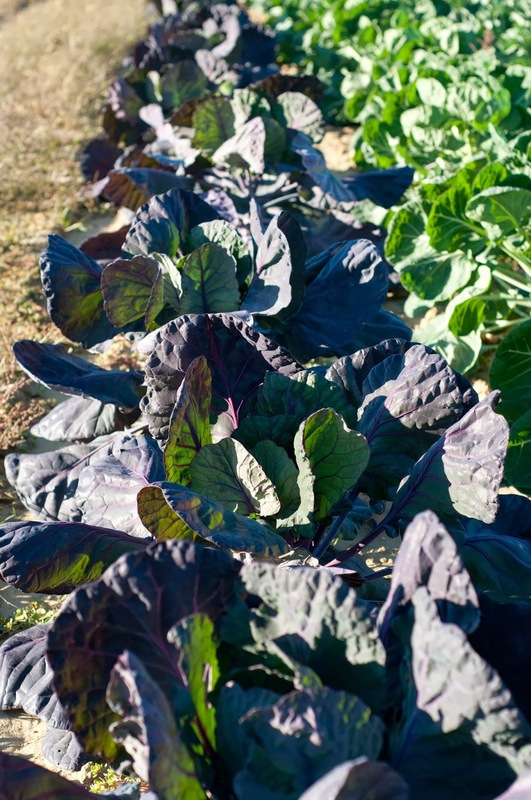 We started all of them in flats in the greenhouse and then transplanted them in the field in early August...optimally it should be done a little earlier. 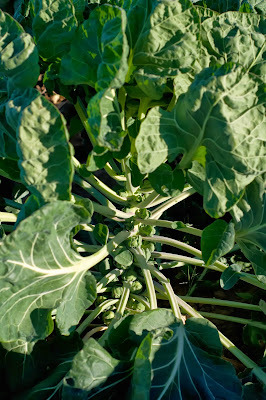 Brussels Sprouts in the Field...look at those leaves! They are in my top three favorite vegetables. I could eat them every day...no problem. My favorite way to cook them is: sliced in half, tossed in olive oil and then roasted. Then I throw them in a skillet and cook for a short time with some freshly cooked crumbled bacon. 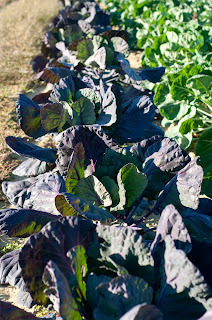 I gave a red variety of Brussels Sprouts a try this year. The are pretty but quite a bit further behind than the green variety. Hopefully I'll have some to list on the Buying Club soon.